Commentary: This one might look familiar. 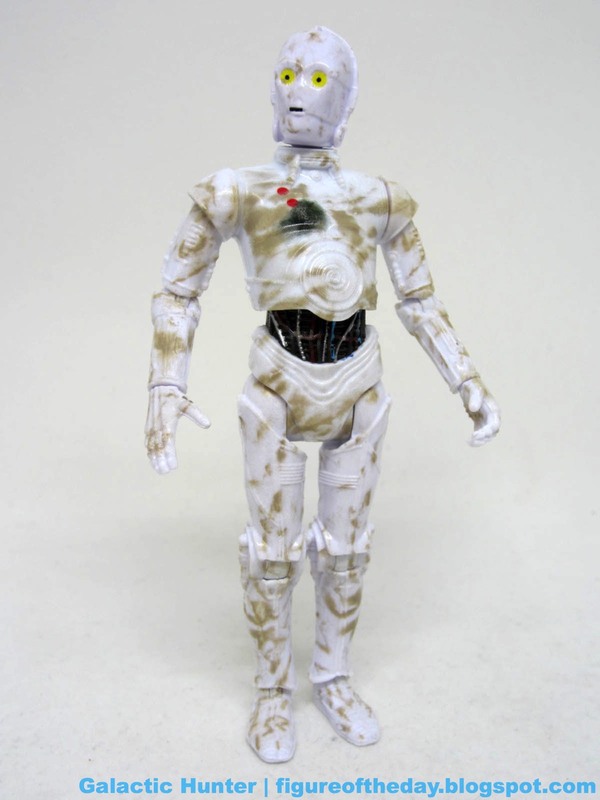 The White CZ Series Communication Droid is a droid that appeared in two films with two different names, but the same suit was supposedly used with minimal (or no) modifications. 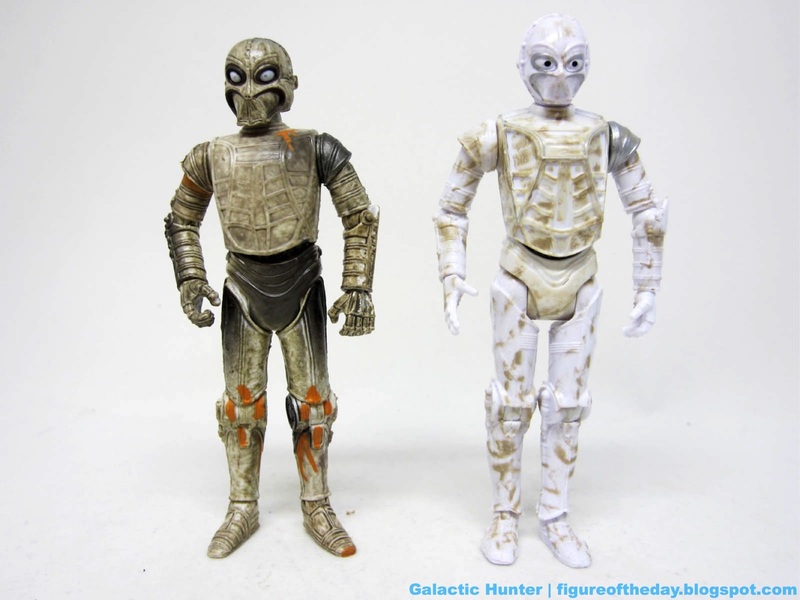 A CZ-4 action figure came out in 2007, and this one looks a lot like it - but it also looks like reference photos of CZ-3 (from Mos Eisley) and CZ-1 (from the Sandcrawler) from the original Star Wars. And it could stand in for CZ-4 in a pinch, of course. The figure you see here has specific arms, as well as a head and body. 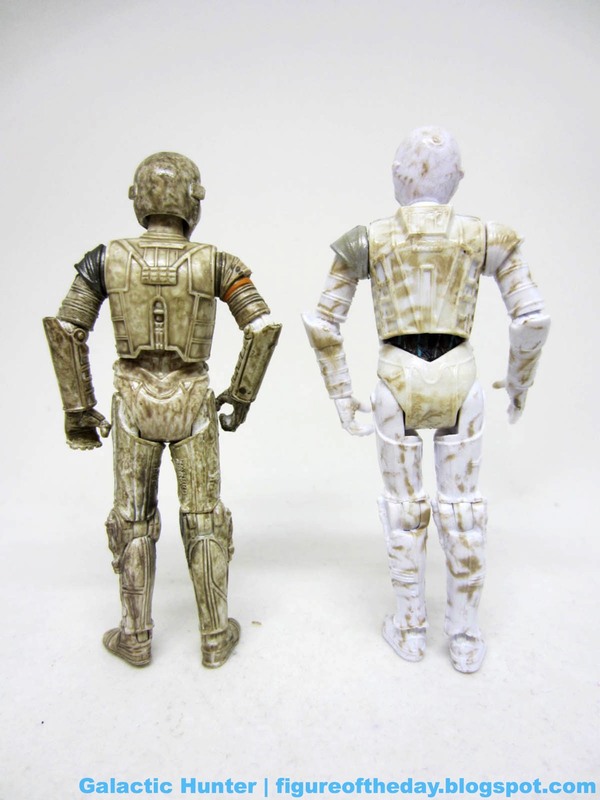 The legs are the same as C-3PO, and the dusty deco is also the same as the white protocol droid. Articulation is just fine, with 20 points of articulation. I love the sculpted detail, although the glossy white plastic isn't exactly what I would have pictured for this generally dusty and worn robot. 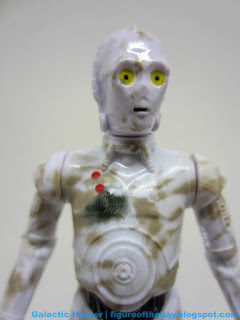 Disney's crew did a pretty good job getting the major paint details right, such as the dirty deco, the silver shoulder, and the dots in the eyes. The wipes weren't quite handled to match the movie, but you get the idea of who this is - and we all need droids to fill out shelves. It's worth noting that this isn't the CZ-4 mold. That Hasbro figure splits at the waist, presumably by design, while this one pops apart at the neck/shoulders/hips. You can indeed throw parts around a Sandcrawler - and you're probably going to see a big Sandcrawler again soon - so you should probably snag this one. If you're happy with CZ-4 (and have a few of him) you're all set, but this one is certainly welcome to add to the seemingly unending droid hordes. It's worth the asking price, although the trip and the wait in line may not necessarily be worth the potential exhaustion and emotional turmoil. 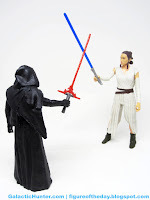 Commentary: A recurring theme I have here tends to be how toys stopped being toys - straddling the world of "toy" and "collector item" never was the strong point of an action figure, unless that was the only option we as fans had. 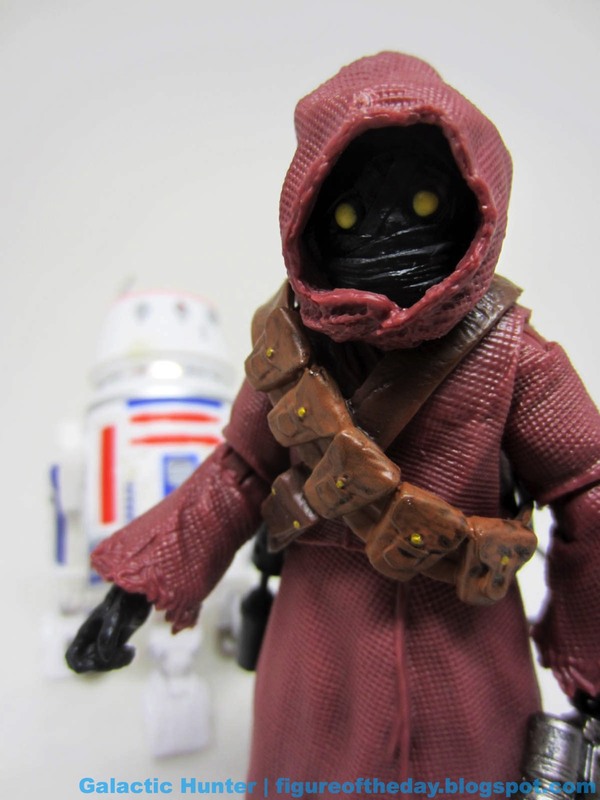 Today if you want a Jawa, you've got choices spanning four decades. 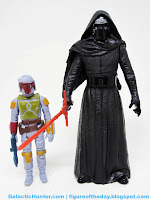 Features change, but some elements are consistent - this 6-inch scale figure is very similar to the ones in 2007-2009, in that you have an almost super articulated figure. 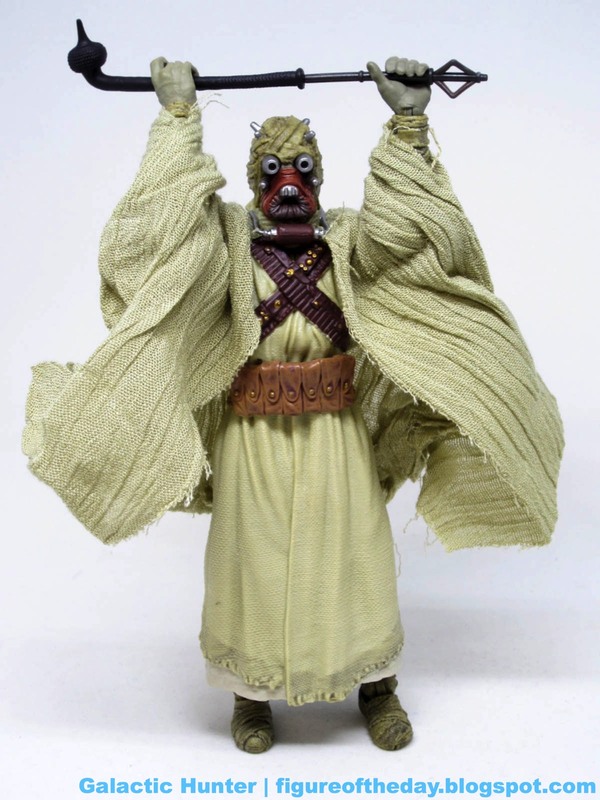 The arms are, but the legs are restricted by the expertly sculpted robes. This is somewhat infuriating, because money was spent sculpting, decorating, and articulating the legs. Each one has a hip joint, a knee joint, and an ankle joint. They will do you zero good unless Hasbro decides to release a version of this figure with a cloth outfit. And they might - even the hood appears to be a separately molded piece, allowing them to cover the figure with cloth and maybe even getting some value out of those leg joints. In the 1990s, fans often derided one-legged (or in some cases, no-legged figures) as salt shakers. These helped keep costs down a bit in an era of $4.99-$5.99 action figures, and for some reason Hasbro started adding useless leg articulation to these figures a lot starting around 2006. 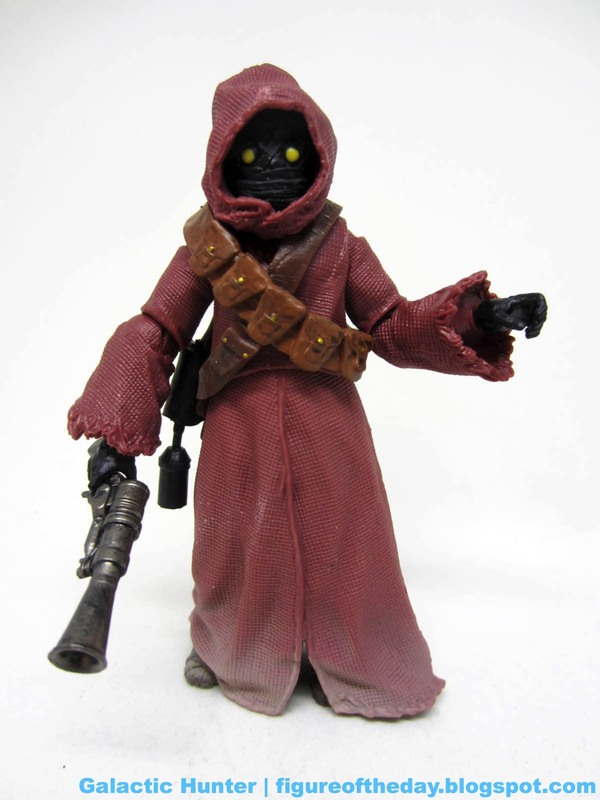 Keep in mind we used to get two Jawas for $5, and I'd be lying to you if I said this was a $20 value for a single 6-inch scale Jawa. It's not. It's nice, it's cool, and it's an essential part of getting the original 12 Kenner action figures in this new size. But is it good? It's adequate. The loss of the cloth robes stings a bit, much like how the Death Squad Commander isn't grey. It's Kenner-ish. It's Kenner-esque. 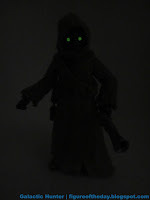 Maybe there's a Comic-Con exclusive coming that hasn't been announced, but as it is it's something of a disappointment. Authentic, sure. It meets the criteria most fans demand. But it ain't great. 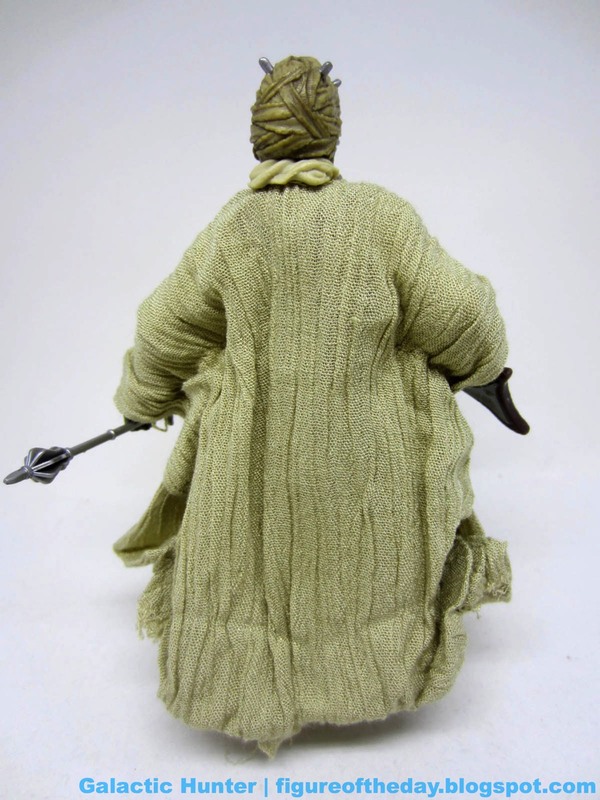 The figure has tattered robes and white dust at the hem, giving it a fairly decent look. Thanks to the overall deco budget, it looks like a brand-new set of robes pre-stained, but from a respectable distance it looks just fine. 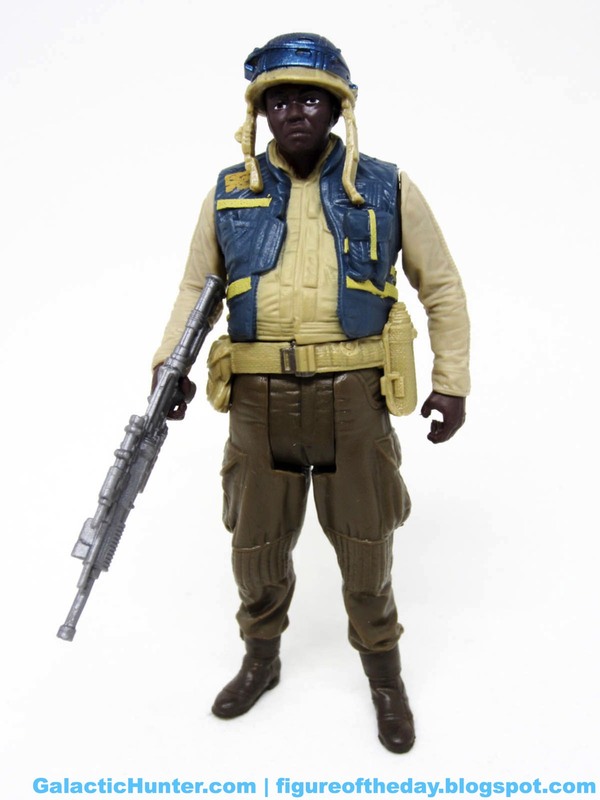 The bandoliers cross his chest, and its yellow eyes are nice and bright - in this respect, I'd say it's as good as the 1978 figure and better than the 1996-1999 ones. The black mummy wrappings still cover his face, and the black gloves are all here. There's not a lot of deco here, so other than "make it really filthy" Hasbro pretty much knocked it out of the park. 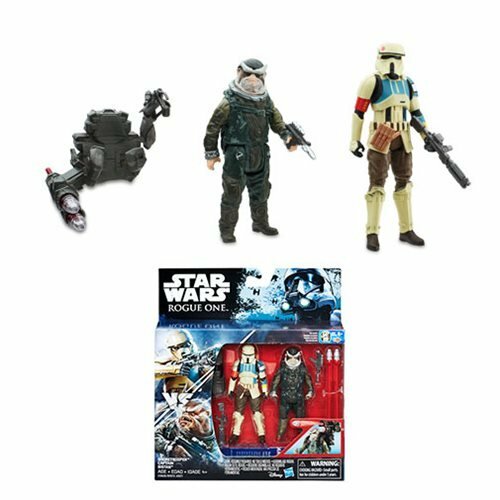 He has two blasters, plus on-belt storage for the wired one. One is wired to a power source, and the other is easily held in his hand. There's a little bit of deco here, but nothing too mind-blowing. I've mentioned in the past that some 6-inch figures don't benefit at all from super-articulation and this is one of them. 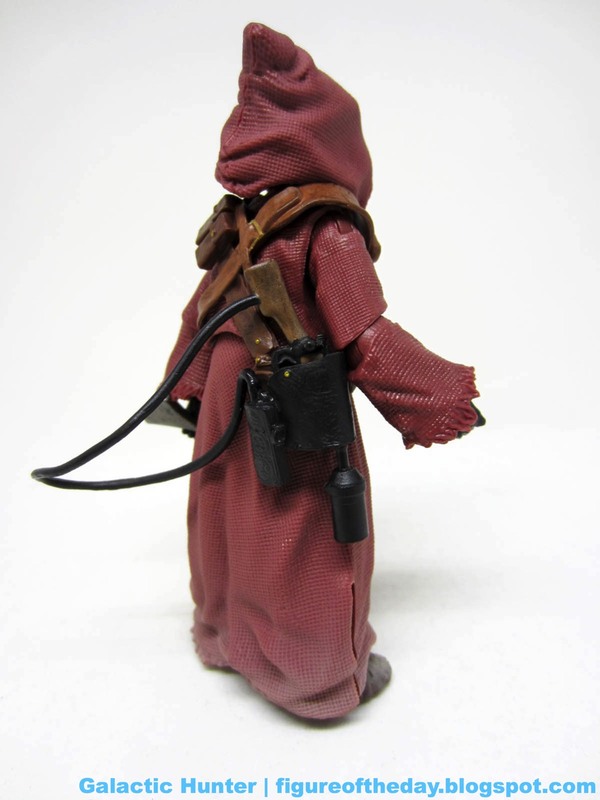 It's a Jawa - a fan favorite, an essential thing in any group of action figures based on the saga. But it's not great. 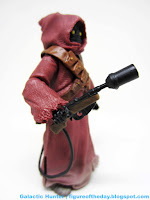 We're used to getting a droid, or a second Jawa, in most packs - at $20 we really need something meatier in the box. 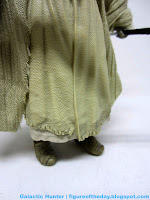 Swappable robes would have been a huge bonus, but like the Yoda I don't see how this figure is in any way better than a $13 3 3/4-inch super-articulated figure. It's basically sized similarly to the 3 3/4-inch-ish Chewbacca, and it's not exactly massive. 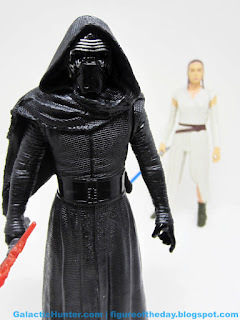 Nobody is fleecing us here, Hasbro is delivering the kind of product we expect (and in some cases demand) but from where I sit, it's kind of a bore. It's just like the smaller cheaper Jawas - which included droid accessories - for a much higher price and much lower value proposition. 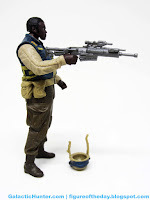 Aside from the useless leg articulation, the execution is absolutely spot-in - it's just not meaty as Lando or Obi-Wan or other recent releases. Obviously get it on sale (lots of them), and at full price you'll probably still want to buy one to finish the collection. Just don't anticipate being impressed. 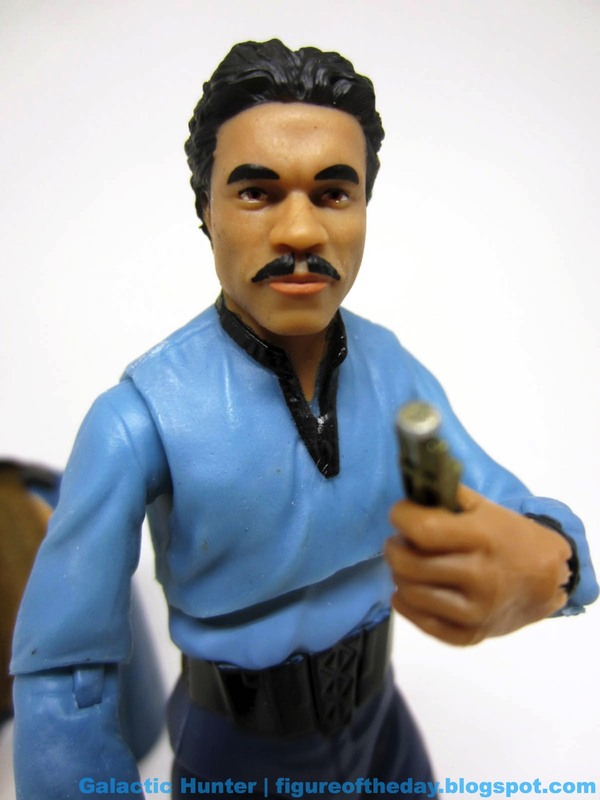 Commentary: I'm really glad we got Lando Calrissian already - although I'm somewhat surprised they didn't just wait for the Han Solo movie. Based on his most famous costume, Lando Calrissian has a rubbery plastic cape, his communicator, and a blaster. His blaster is famous as an update of the original Kenner figure's weapon, and it's also in many publicity stills. I'm not sure where it actually appears in the movie though, now that I think of it, but maybe I'm just getting old. It's painted and looks just like any decent Rebel blaster. He also has his intercom commlink/communicator - it fits in his hands perfectly, with a golden top part and a silver bit underneath. 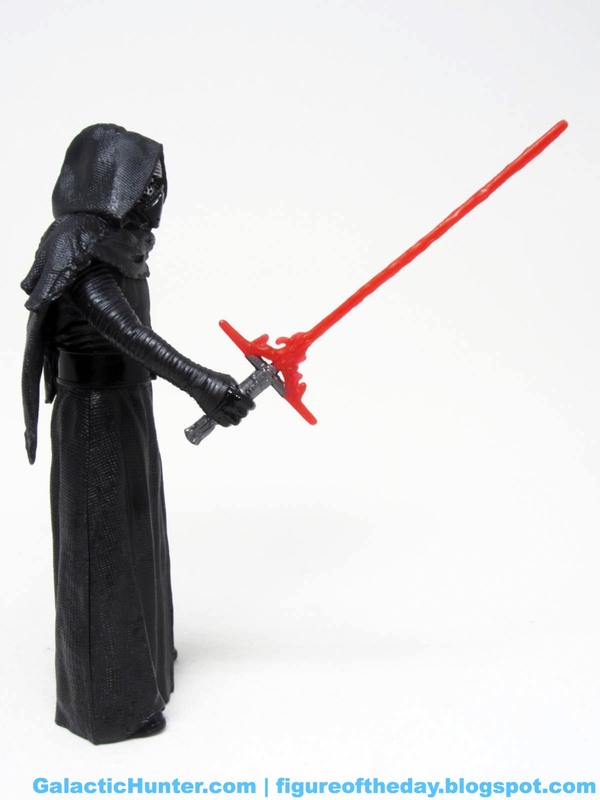 His left thumb is molded perfectly to hold it, so kudos to Hasbro on that and keep in mind he has no on-figure storage for this accessory - take care to not lose it. 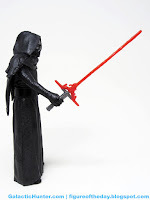 Of course, what you want to know about is the cape - it smells of rubbery plastic, and the sculpted lining is quite nice. The deco doesn't quite match the actual costume's lining, so the interior really gives you more of an impression of the material rather than an exact match. 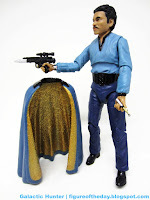 It hangs over his shoulders nicely, with the black collar and blue exterior. It hangs well. It's sculpted nicely. 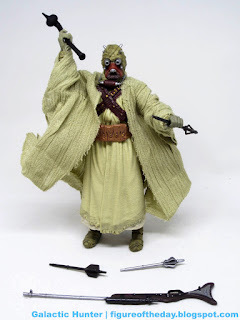 I'd be hesitant to say that it would be possible to make a better cape given the cost of the figure and the minimal chance of them ever reusing this piece on another toy. The figure is no slouch with at least 26 points of articulation. I'm not super keen on the eyesore torso joint (rather than articulating the figure at the belt), mostly because he can't do much ab crunching. The forward/backward motion is minimal at best, so the ability to swivel to the sides just makes it look wonky. The arms and legs move well, though, and look mostly fantastic. My sample had some weird white rough patches on the pants, for reasons I don't entirely understand. The cut on the hips gives the figure a good range of motion, but the silhouette is a little diaper-esque. But at least he can assume a number of really cool action poses, thanks to the rocker ankles, double-knees, and everything else. I love how the head turned out, especially as the eyes and mustache all seem painted on straight on my sample. The eyes have a bit of gloss on them too, so that's an added bonus. The hair is great, the sideburns are good, and the costume is pretty uniform. BUT - there's a super cool wrist communicator with painted lights on his right wrist! That's awesome. Nicely done, Hasbro. So - it's pretty good. I don't like the torso, but everything else turned out pretty well. I hope to see a "Vintage" package variant some day, but I'm not holding my breath. It would have been stupendous to have a stormtrooper blaster thrown in for good measure, but I'm very happy that they gave him the microphone. For $20-$25, you're going to like it. Maybe even $30. 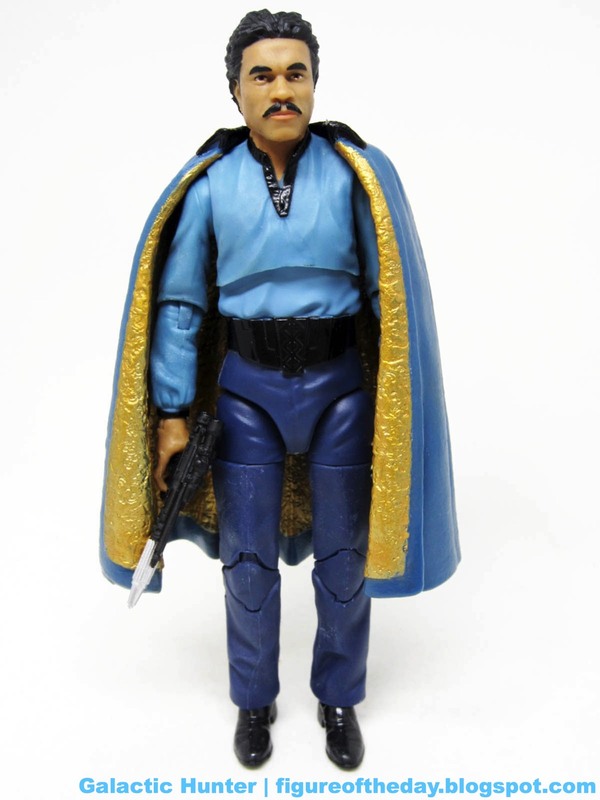 I assume it might be a while before we get another 6-inch Lando figure based on Billy Dee Williams, but maybe Hasbro will surprise us in the next couple of years. And hopefully we'll see him pop up in one of the sequels. Commentary: Here we go again. 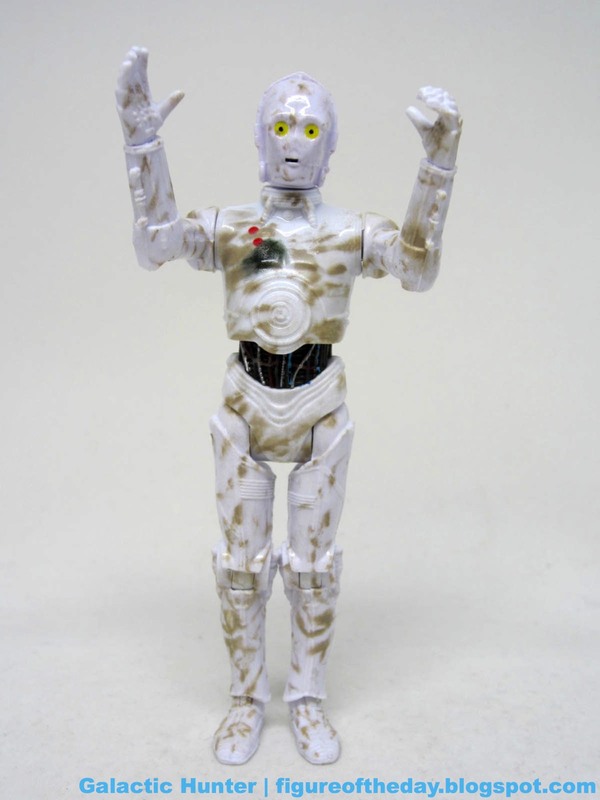 Misery for collectors tastes like Disney, because the Vendor Droid is exclusive to their theme parks and is sold in pieces. The pieces you need to build it may not be available on a specific day - a pal of mine helped me out, but I also got a fair amount of mismatched droids due to availability... so I need more parts. And I'm very fortunate - otherwise fans have to resort to a massive vacation to get them, or bribes, or eBay. 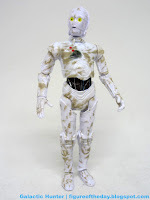 The basic body of the model we're looking at today is C-3PO with new colors and a new head. 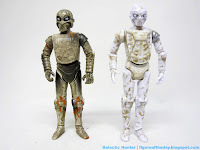 While similar to Hasbro's build-a-droid molds, it's a little different. The feet read "CHINA" and "©LFL", with no year or Hasbro markings. He has 20 points of articulation if you count generously, and why shouldn't you? 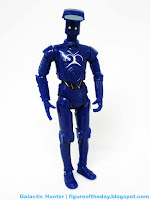 This kind of droid debuted in the CG The Clone Wars animated series, so these mark its first "realistic" action figures - and first figures of any kind. On the show they were frequently green and striped, but this one is dark blue with vintage hot rod pinstriping on his chest for some reason. Maybe there's a story here, but I can't tell you what it is - maybe this is a hint about something in the future Star Warsland park that will open eventually. 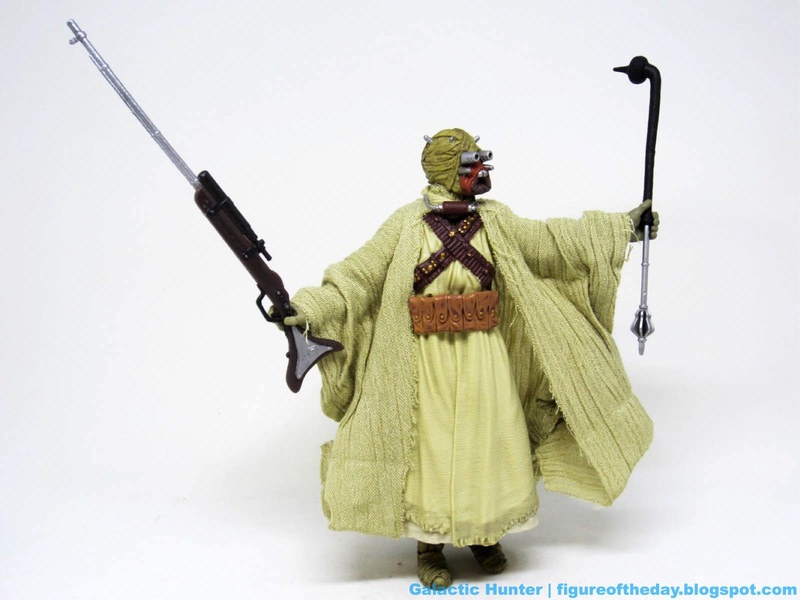 The figure's ability to stand and sit are worthy of praise, although I'm increasingly ambivalent about how the action figure world is packed with incompatible styles. 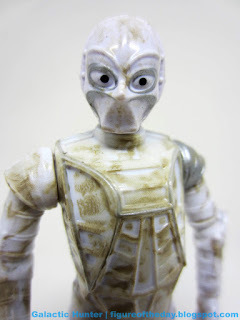 This may be "old man" though, as back when I was a kid there were 3 distinct scales of action figures from Kenner and all of them were compatible within their own lines. Well, maybe not the Ewoks cartoon figures, but that's OK. Today, the 3 3/4-inch format not only has cartoon formats, but multiple ones. 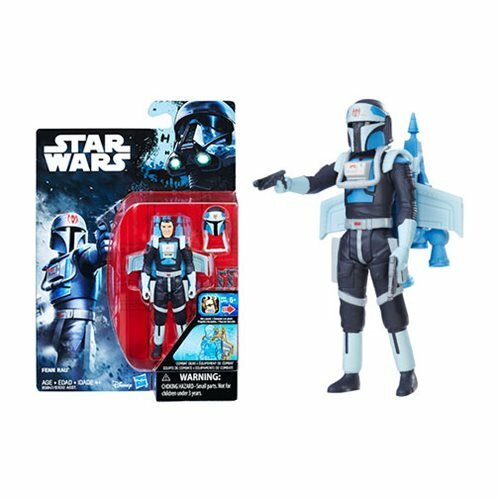 The Clone Wars figures are a mix of "real" and "animated" figures, but at least Hasbro has given us a consistent 6-inch The Black Series line. What make each of the figures we'll look at here distinctive is the head. Here, a peg goes in to the body and swivels around. A can-shaped head has two piercing yellow eyes and an unpainted mouth slit, plus a hat that looks like a flood light of some sort. Maybe it's a price scanner. 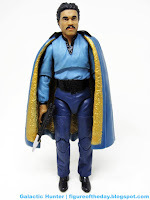 I actually don't know - but it's distinctive, and the blue chest marker looks a lot like some sort of Hutt crime tattoo. The dark color absorbs a lot of the detail, but it's still sharp. The can itself is a little light on markings, but the body has a ton of bits and pieces thanks to the various limbs and body parts being recycled protocol droids like C-3PO and 4-LOM. 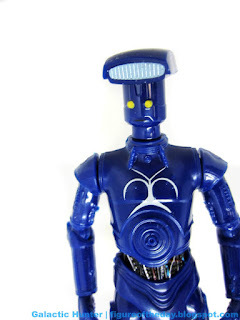 Because Hasbro hasn't distributed a single Vendor Droid in any of its lines in any scale, you need to get one of these guys from a Disney park. 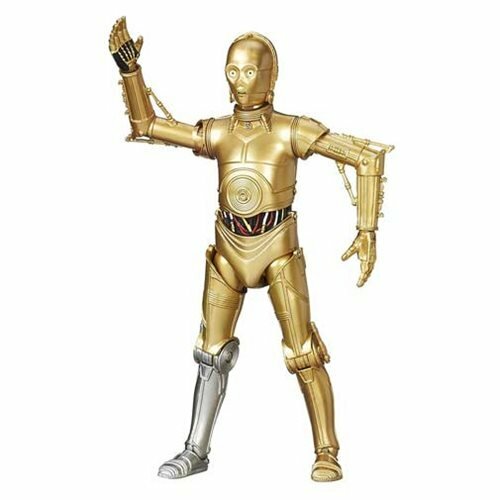 I don't think they've made any show-specific droids yet, but you have blue, red, silver, white, black, and gold flavors for your droid enjoyment. They fit right in with your Hasbro collection, which is simultaneously great and infuriating. At least it exists, and you have options. Commentary: As I'm in the business, I see stuff early. I didn't see Lieutenant Sefla (the figure) early but sometimes names show up and I had to ask "Who the heck is that?" Raddus' name and Galen Erso were known entities, but prior to the movie nobody knew who Sefla was. I eventually found a blurb confirming the actor who was cast in the role, but that didn't help things. I saw the movie, and that didn't help things either. 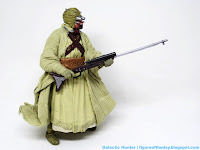 This is a nifty, distinctive Rebel trooper - but why this one? Galen Erso is a pivotal character portrayed by a well-known character actor. Admiral Raddus steals the show. Sefla, I'm not 100% sure I could point out in the movie without a freeze-frame. Mercifully Hasbro delivered a pretty good figure for us to puzzle over, assuming you can find him online to buy somewhere. 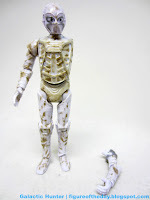 As with most recent figures, Sefla has 5 points of articulation including a ball-jointed neck. 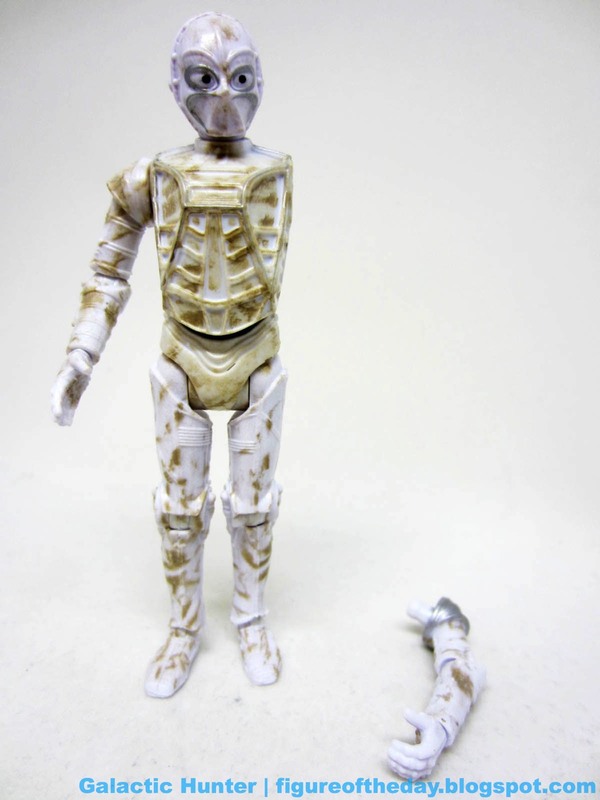 What's a real treat is his helmet - it's removable! It looks like a high-tech version of something the US forces might have used during Vietnam, mixed with elements of the helmets we saw on Endor from Return of the Jedi. The straps hang down nicely, with painted green and grey bits bringing it to life. 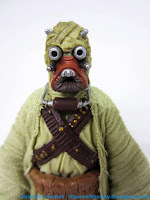 His head sculpt looks like the pictures you'll see in guide books, with a blaster unpainted to match. I'm stunned that while Raddus was hollow (and I have touched the sky), Sefla is actually solid plastic in his torso. This gives him a little more heft, which is a curious choice given he's a little rounder than most figures. I like that the colors of his uniform have a familiar vibe, even if he could stand to have more and brighter paint applications. It's the only Sefla I assume we'll ever get, so at least I can say I'm happy he can stand up and hold his gun. His legs also swing forward far enough that he should fit in many vehicles without much of a fight - a huge plus. 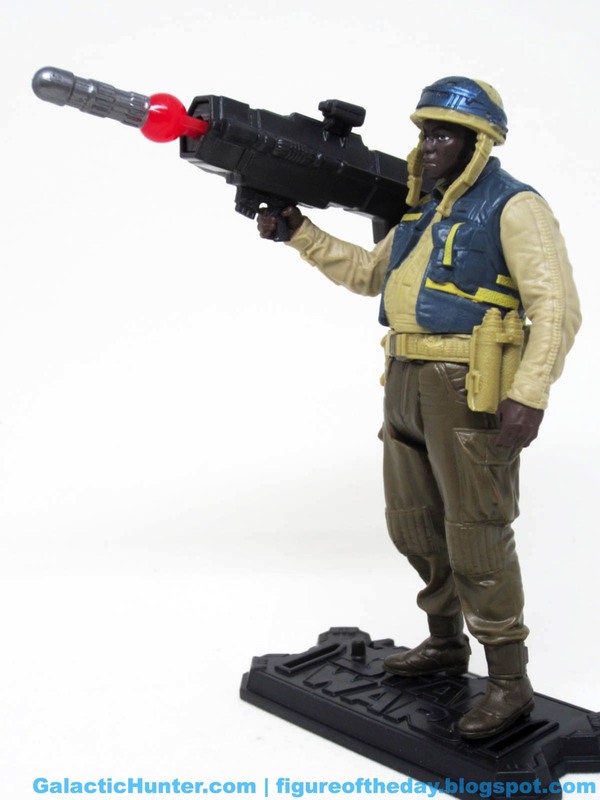 I'm even more surprised that his bazooka is cool. The design is marvelous - the plastic projectile is a grey rocket, with a red explosion trailing out from behind it. The launcher itself looks good, with some nice deco. Brilliant! Unfortunately it's too heavy for him to balance it, and the shoulder covering part doesn't necessarily stay in place. I don't love the execution, but the thought process put in to making this particular accessory has me giddy. Hasbro actually exploited the safety requirements for its bazooka projectile to make something that would be even cooler than just a small firing rocket designed to choke children ca. 1978. Sefla's a good modern Hasbro figure. It's not the best ever, but we're fortunate that we got this new character instead of yet another retread of someone we already purchased. The sculpting is good, the deco is mostly on the spot, and he's a display stand away from being everything he should. If you have the means, get one. Also if you ever hear why we got him instead of somebody else, I'd be curious to know. He's not bad - far from it - I'm always just a little bewildered when someone like a Ric Olie gets a figure that must have been in development before the final cut of the film. The rumor (fact?) was that the performance for Ric Olie wasn't good enough for the final cut, and I can only assume Sefla was surgically edited out after the reshoots. But I don't know this - I do know he turned out well enough to make me happy that he exists. 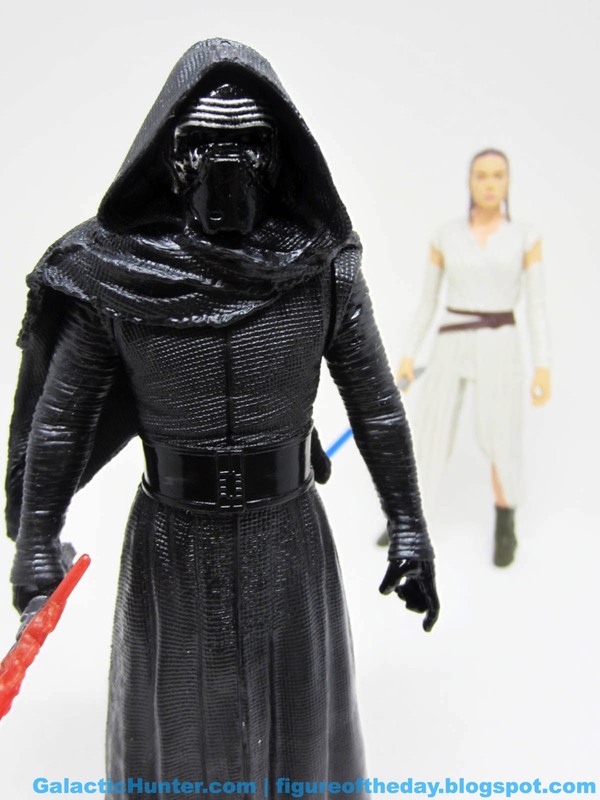 Commentary: It seems Kylo Ren sells well. This particular version hasn't been offered in the USA as of yet, it's a 6-inch tall figure with jointed arms and a moving waist. 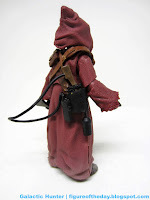 The neck is a separate joint too, but the hood hangs over his back preventing movement. 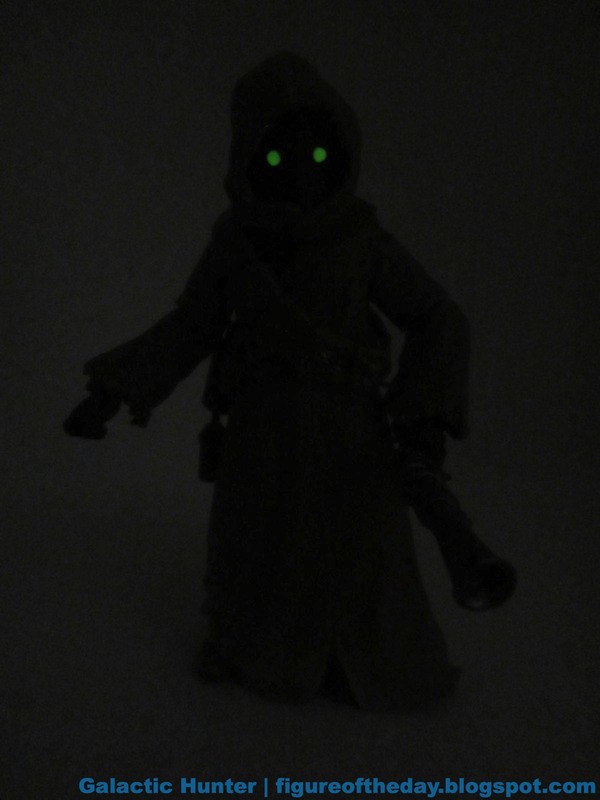 Thanks to his distinctive build the figure is a bit hollow - and I do mean that literally - but he stands without any fuss and can hold his lightsaber. Too bad you're going to have to go overseas or do lots of networking to find one, as it scarcely shows up on the electronic bay or online toy sellers since most people aren't even aware it exists. 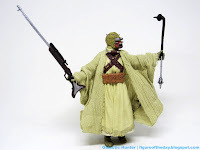 The whole cloaked Darth mummy thing works pretty well here as it usually does, with the crossguard lightsaber fitting perfectly in his hand and, if you ask me, looking better than most other of Hasbro's takes on the weapon as an action figure accessory. The energy spills out of the emitters, and even though the hilt is only painted one shade of grey it still looks superb. I just wish you could turn his head. For six bones, it's magnificent. For ten dollars, you could just as easily get the 12-inch figure. 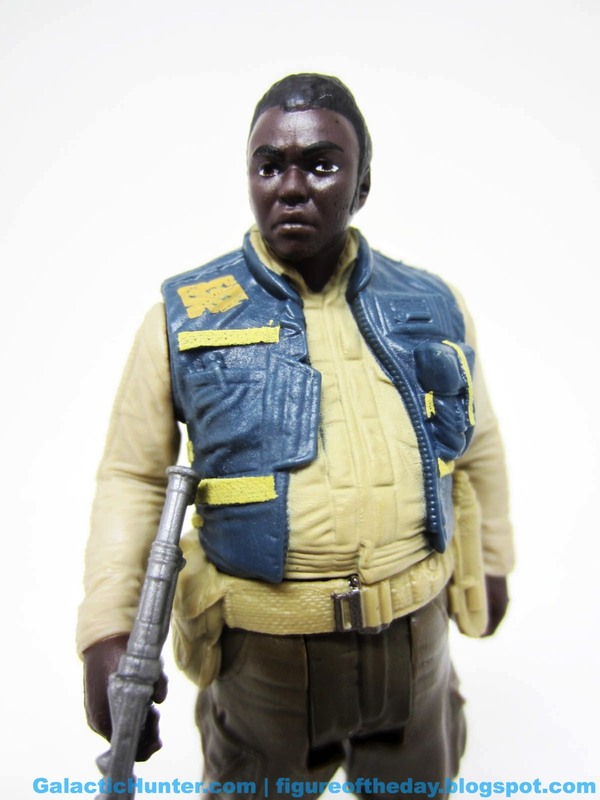 For more than that, odds are you'd be better served getting a big Jakks Pacific figure or Hasbro's The Black Series release - especially if the latter is on markdown still somewhere near you. Were this at Big Lots! near you right now, I'd say run out and buy yourself one because it's cheap, sizable, and would look great as a work decoration. Especially because at $6, if it gets stolen, you wouldn't freak out - but it's not $6, it's a scarce international collectible now. I'm glad I got mine, and I hope Hasbro continues to pump these out, slowly, over the coming years.